Whoa! It’s been a long time since I blogged on here. Life, you know. It feels great to be back and even more great to be starting back again with a book review and interview with my favorite author! Ronie Kendig writes incredible books. Plain and simple. Her characters are complex, deep and so realistic that you can feel their emotions. Her plots are heart-racing, page-turning masterpieces. Once you go Rapid-Fire Fiction, you never go back! Once you pick up a Rapid-Fire Fiction book, you never want to put it down! ‘Thirst of Steel‘ is a book you will want to finish in one sitting. There were several nights where I had a very unhealthy respect for the following day as I read into the early morning hours! I loved this book! Okay, I say that about all of Ronie’s books, but it’s no less true with Thirst. The series was a wonderful ride into the supernatural, while still staying deeply rooted into reality. I felt the panic as I ran with the team through the streets of foreign cities, felt the pull of power and the desire for health, cried as the book unfolded it’s secrets. Ronie wove a tale that, while supernatural, was so natural to humanity. She pointed to the true holder of power, while there are so many pulls on our allegiance in this world. This was a fast-paced, giant-sized adventure that I know I will read over and over again. I had the honor of asking Ronie a few questions about this series. 1. What do you like about writing the supernatural aspect of ‘The Tox Files’? To me, the supernatural aspect of the story is simpy a very strong parallel of the supernatural realm intricately tied to most Christian’s lives–the existence of angels and demons and an omnipotent God. 2. What did you find most challenging about adding a supernatural element to your already amazing action stories? The hardest part is probably twofold in that I do not want those elements to overshadow the larger story, but rather complement it, and in doing so, I am careful to make sure those elements do not contradict the Word of God and are grounded in sound theology, because the point is to remind Christians the supernatural realm is truly there. In a society like ours, it’s easy to discount and dismiss it as “irrational,” but when we bring God down to our level, He’s no longer God. 3. What do you love the most about ‘The Tox Files’ series now that they are all finished? Looking back, I think I fell in love with having the team dynamic paired with an archaeological thread paired with the supernatural. That’s been so wonderful to explore and so challenging to write. 4. What projects are you working on now, if you have some that aren’t super top-secret? As announced in my recent newsletter, I am working on two new series. One will be with Bethany House and is another paramilitary-archaeological series (without the supernatural this time), and the other is a science fiction (space opera) series with the same publisher who did my fantasy series. Both of those first books will release next year. I hope that you enjoy her answers and will go out and get ‘Thirst for Steel’. Check out ‘Warrior’s Seal‘ (the FREE prequel! ), ‘Conspiracy of Silence‘ and ‘Crown of Souls‘ as well. I recommend starting with the first book in the series and reading through. You will love getting to know the characters! 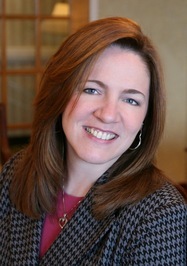 Find Ronie on her website, Facebook and Twitter! Find all her amazing books on Amazon! Have you read Ronie’s books? Which is your favorite? Interview with Ronie Kendig + Grand Prize Giveaway! This is a big day for me. If you follow my blog, you know that I am a big fan of Ronie Kendig. I never miss one of her books and pretty much spend months looking forward to them before their release date. FALCON was no exception. This book was made even more exciting for me when I found out that I was going to get the chance to interview Ronie!! Seriously, this is so awesome for me. I’m am honored to call Ronie friend as we’ve had many conversations about writing, editing and life. God blessed me with one of the coolest gifts when He brought Ronie into my world. I am still a bit starstruck each time I chat with her. Even thought she is one of the most humble, most down to earth ladies I know! FALCON released this month and I got to ask Ronie some questions about this amazing book. Here’s what she had to say! Ronie, thanks for chatting about FALCON with me! I thought it was one of your best books to date. I seem to say that a lot about your books, but this one was so far exceeding my expectations… and I have high expectations when it comes to your fantastic writing! First of all, what do you hope readers get out of FALCON? As with any of my novels, I pray that readers come away with a sense of hope, that no matter how dire things are in life, they know there is hope in Christ. I’d also like to see readers recognize the important of self-forgiveness, because, sometimes the hardest person to forgive is yourself. What was the hardest thing about writing FALCON? In all honesty, simply writing. I was so terribly burned out when it came time to get FALCON done, that I literally cried *every* time I sat down to write. I truly leaned on God, and I give Him all credit for the story that lives between the pages of that amazing cover. What do you love most about Sal and FALCON? Since FALCON is the last in the series (I’m still secretly hoping for Titanis to get his own book), what was your favorite thing about writing this series? You’re not the only one holding out for Titanis. *grins* I really liked this team of soldiers. They were different from the Nightshade team because they each felt (at least to me) like their own person, with distinct idiosyncrasies that often caused some friction among the team, but also a cohesive unit. They had their beefs with each other, but when it came down to it, nobody mess with their team. My last question to you is, HOW COULD YOU? Well, I sure wouldn’t want you to go against Raptor! Thanks for the chat, Ronie! If the last question grabbed your interest and you want to see what made my jaw drop, you’ll want to enter my giveaway below! 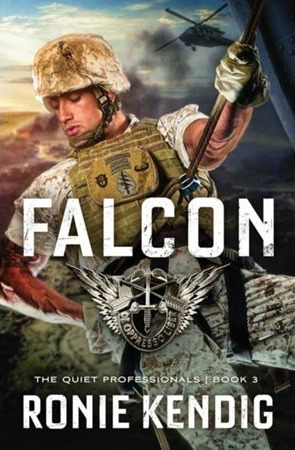 You have a chance of winning your very own copy of FALCON! Trust me, you want to get your hands on this amazing book! Enter today if you live in Canada or the US! Connect with Ronie on her (AMAZING new) website, Facebook, Goodreads and twitter! I won’t waste time chatting when I know what you’re here for. Here’s your sneak peek of Operation Zulu ~ Pt.2: Out of Nowhere!! Coughing, Téya rolled, agony squirming through her as she fought for air. It was then she saw the booted feet. Followed the black pants up to a black shirt. Corded muscles. And a face of fury. She hadn’t hit a wall. The man who’d followed her hit her. He grabbed and yanked her up off her feet. Blinded by pain and groping for air, she struggled to think. Then oxygen flooded back. She swung her arm back then aimed for the side of his throat. He blocked and nailed her with one of his own. Again unable to breathe, she dropped to her knees, straining for air. Feeling her temples pound. She wobbled to her feet. But the man shoved her forward. Her head hit the wall. Bounced off. Stars sprinkled across her vision. Téya braced herself, then threw her head backward. But he deflected. Moved away. again. In that split second, Téya took in her surroundings. His position. She swung her legs to catch his. Indignant, she flipped onto her feet. His punch nailed her jaw. She spun, gritting her teeth and tasting the blood his hit caused. His hits came again. And again. Driving her back. . .back. . .
She heard it now—the river. Heard the lapping against a wall or rocks. Smelled it. Felt the dampness. He was going to knock her into the water, no doubt hoping she was unconscious. Oh my goodness!!! Now I can’t wait for Part 2!! 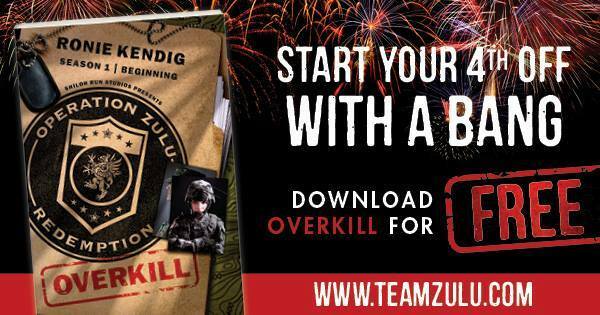 If you haven’t checked out Operation Zulu, you can get ‘Overkill: The Beginning’ for FREE! Just click the banner below and strap in for this high-stakes, action-packed serial adventure!! Do you Zulu? What have you thought so far? Are you as eager to get your hands on Part 2 as I am? They hoped it would never happen and now it has. The call has come in. They are desperate to save the rest of the team, but can they make it on time? What prompted the new attacks after such a time of quiet? How can they get in front of this threat and prevent another disaster? I love the dynamics of Ronie Kendig’s new team. They are still haunted by the past, yet trying to move on. Someone doesn’t want them moving on. Someone wants them dead. Each of the characters has an amazing story to tell and I can’t wait to hear them all! There are some interesting dynamics floating around and I love how Ronie is building the mystery while still revealing so much. Desperation and panic drip from the pages. In the first instalment of this five part serialization, Ronie will pull you in with heart-stopping action and pulse-pounding twists. It will leave you not wanting to put this episode down and dying for the next!! You can get this episode FREE!! Go HERE!! Here’s a few places you can find Ronie! They never should’ve existed. Now they don’t. In the aftermath of their first highly successful op, the first all-female special ops team, known as Zulu, discovered that innocent civilians—women and children—died at their hands. Zulu was set up to take a devastating fall. Fearing for their lives, the Zulu team vanished. With new identities and spread across the globe, they live in relative but isolated peace—yet still haunted by the past. Terrified of being discovered. Five years after that horrific night, they begin to hope they might be safe and the tragedy forgotten. In the aftermath of this betrayal, Trace hid them. He’s never forgotten – never stopped being their team leader. Now his team is being targeted and he won’t stop until he figures out who had it out for his team then and who is eliminating them now! Whoo boy!! I knew I’d like Trace from the minute he walked on the scene. All business, in command and intense. I love Ronie’s military heroes! I admit that I have yet to meet a hero of Ronie’s that I didn’t develop a bit of a book crush on. She writes an awesome hero! *cough* I will not mention a certain man named Canyon, and I certainly won’t mention a book called ‘Wolfsbane’. *cough* Wait, where was I? Now, not only can you go on a mission with this awesome team… you can get the first episode TOTALLY FREE!! Grab your gear, put on your boots and grab it HERE! Then, you can pre-order the next 4 episodes. Trust me. You want to be on this mission. It’s going to be a heart-pounding, breath stealing thrill-ride! Learn more about Ronie Kendig and her awesome books on her website, Facebook, Twitter, GoodReads and check out her other books on Pinterest! Today is the day I, and I hope you, have been waiting for!! Overkill is here! Operation Zulu arrives today and the first episode is absolutely FREE!! YES! FREE!! Get your copy today at www.teamzulu.com! Here’s a few places you can find the amazing Ronie Kendig! Tomorrow heralds the arrival of Operation Zulu! With Ronie Kendig at the helm, you can be assured that there will be moments of held breath, rapid heart-beats and a gasp or two! So, how about it? Are you ready for this mission? Sign up today at www.teamzulu.com for this action-packed journey!